Will Middlebrooks (left) was congratulated by Dustin Pedroia after scoring on a fourth-inning double by Jacoby Ellsbury. KANSAS CITY, Mo. — It was telling, perhaps, that Will Middlebrooks waited until after he was done with batting practice on Saturday to speak to reporters about getting called back up from Triple A Pawtucket. After walking into the clubhouse at 3:09 p.m., Middlebrooks got reacquainted with his teammates then took a seat in front of a laptop computer to watch video of Kansas City starter Jeremy Guthrie. Meetings with the coaching staff followed. The 24-year-old third baseman was demoted June 25 because he was hitting .192 and lost his job to Jose Iglesias. But team officials also thought Middlebrooks had grown too comfortable with the trappings of life in the majors after a solid rookie season. When Iglesias was traded July 30, the Red Sox left Middlebrooks in Pawtucket and used bench players Brock Holt and Brandon Snyder in a platoon at third base. They also mentioned, frequently, the possibility of using 20-year-old Triple A shortstop Xander Bogaerts at third. Middlebrooks responded by making adjustments at the plate that led to him going 12 for 38 (.316) over a 10-game stretch with an .857 OPS. That earned him a promotion. Overall, Middlebrooks hit .268 at in Triple A with 10 home runs and 35 RBIs in 45 games. The Sox were almost forced to make a decision. Holt and Snyder were 5 for 38 (.132) with three RBIs after replacing Iglesias. They were hitless in 19 consecutive at-bats. Now Middlebrooks, who batted ninth Saturday and went 2 for 4 with two runs and two RBIs in the 5-3 victory over the Royals, will get a chance to regain his old position. “We feel like we have the potential for adding a power bat for the lineup. He’s putting himself in a better position to hit over the last probably 7-10 days by just getting a little bit more squared up with his hands in the box,” manager John Farrell said. Bogaerts will split time at Pawtucket between shortstop and third in case he is needed. Farrell said age was not a factor in going with Middlebrooks over Bogaerts. The choice was related more to which player was the right fit. “That was the clear choice with Will. Not only because he’s been a third baseman his entire pro career but with what he’s also doing lately,” he said. Middlebrooks experienced a range of emotions during the nearly seven weeks he spent at Pawtucket. He was angry at first then came to realize that he had work to do. DiSarcina and Pawtucket hitting coach Dave Joppie helped rebuild Middlebrooks’s swing and confidence. “It was a really good foundation for me to get my feet back under me and get back to the basics and start having fun again,” Middlebrooks said. 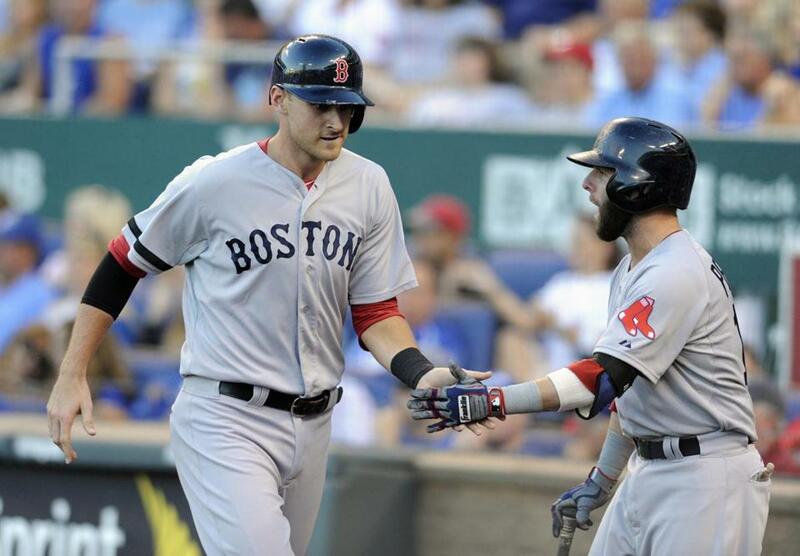 Middlebrooks has to prove himself at the plate; that will determine his future. He hopes that will start with the right attitude. “Be consistent on and off the field.’’ he said. Middlebrooks left Pawtucket greatly impressed with the abilities of Bogaerts. Middlebrooks didn’t view the situation in Pawtucket as competition. “I was there to help him because he’s really young; he’s really raw but he has some of the best tools I’ve ever seen,” he said. Farrell said the Red Sox see Bogaerts staying at shortstop. For now, he will prepare in case a need arises at third base. “We feel like Xander’s continuing to improve in the smaller parts of the game in his development path,” Farrell said. “He’s swinging the bat well. It’s more on the defensive side and the finer points of the game that, right now, he needs continued reps. The Red Sox activated lefthander Franklin Morales off the 15-day disabled list. He had been out since June 23 with a strained pectoral muscle. Morales has pitched six games this season because of various injuries. He had a 3.77 earned run average in 37 appearances (nine starts) last season and struck out 76 over 76⅓ innings. Morales could be a valuable late-inning arm if he stays healthy and regains his velocity. John Lackey, who sprained his left ankle making a fielding play against Houston on Monday, starts on Sunday and has no restrictions . . . Righthander Pedro Beato was optioned to Pawtucket to make room for Morales . . . David Ross started his rehabilitation assignment with Double A Portland by going 0 for 2 with an RBI. He was the designated hitter. Ross has been on the disabled list since June 15 because of concussions . . . The Royals put outfielder Lorenzo Cain on the 15-day disabled list because of a pulled left oblique. Cain was hurt while taking batting practice Friday. The Royals also designated for assignment Francisley Bueno, who picked up the victory Friday with 2⅓ scoreless innings against the Sox, and recalled lefthanders Will Smith and Donnie Joseph from Triple A Omaha . . . It was Nebraska Day at Kauffman Stadium and former All-Star (and Cornhusker) Darin Erstad threw out the first pitch accompanied by the Herbie Husker mascot.